It is a predominant terrain feature in the eastern Superstition Wilderness area. Visible atop most peaks in the wilderness including 15 miles west along the Superstition Ridgeline. This excellent reference point is a great destination too for the semi avid hiker. The peak can be reached by a steep semi cairned use-trail that follows a fence line. A southern approach from one saddle north of Windy Pass is another option. Both ascents are steep and loose. The north has occasional pines in the lower portion and chaparral throughout to help stabilize your stance when needed. The mini Castle Ridgeline is fairly easy travel. Just keep a constant eye out for barbed wire on the ground! From Phoenix take US 60 east. Exit at Apache Junction (Idaho Rd, exit 196) and drive northeast on State Highway 88. Follow 88 past Canyon Lake and Tortilla Flats to the end of the pavement. Continue on the dirt road until you see the sign for Reavis Ranch Trail between mile marker 227 and 228. Turn right and follow this dirt road to its end (2.8 mile). The trailhead is at the north end of the parking lot. The smooth, well-graded dirt roads are easily passable in a passenger car during dry weather. 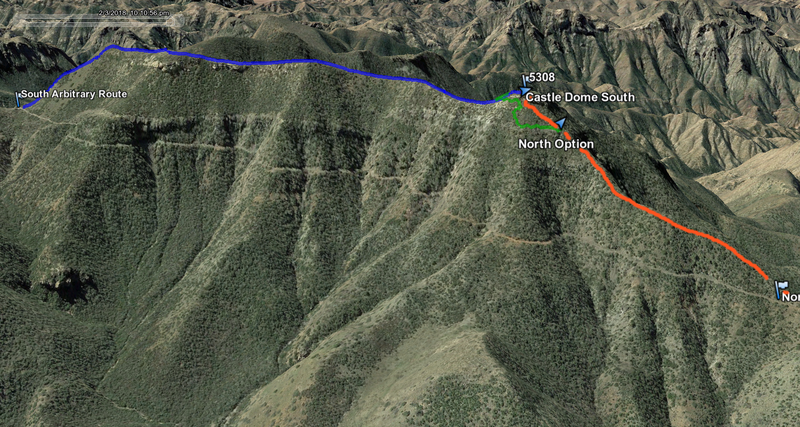 Because of numerous hair pin curves, plan on the 28 miles from US 60 to the trailhead taking an hour.